The Royal Hospital Chelsea, home of the scarlet-coated Chelsea Pensioners, is opening a new event space for corporate hire from next month following extensive restoration work. Wren House, named after the architect Sir Christopher Wren, was once private apartments but underwent widespread renovations last year and earlier this year, including the restoration of its Grade I-listed features. 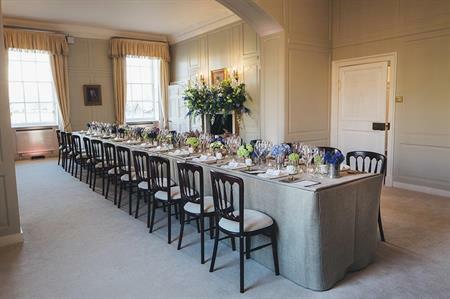 The whole of the house, located within the West Wing of the historic Royal Hospital, which was founded by Charles II in 1682 and designed by Wren, is available to hire for meetings, lunches, dinners, receptions and teambuilding sessions. It comprises three downstairs reception rooms and three upstairs spaces, with capacities ranging from between ten and 50 people seated and between 15 and 60 standing. An outdoor space on the South Terrace is also available on request. Brands are invited to make the 'blank canvas' their own and use the space for immersive and experiential activations. The house, which offers views across the grounds, is designed to complement the existing reception and banqueting rooms. Joanne Cochran, head of events at Royal Hospital Chelsea, said: "Full of wonderful touches and original features I believe it will appeal to those bookers looking for an intimate space, but one with plenty of theming potential for both private and corporate events.